The team behind the (arguably) best Star Wars game is looking to make another. 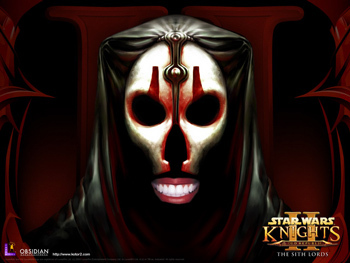 Ask the average PC gamer what their favorite Star Wars game is and there's a good chance they'll name drop Obsidian's excellent Star Wars: Knights of the old Republic II: The Sith Lords. Yes, it was a typical Obsidian game - i.e., a sequel to an established franchise and buggier than a crack fiend's pajamas - but it took the ideas presented in BioWare's original and ran with them. Out of the door. Into space. Now the studio is looking to return to its old stomping ground with another game set in the Star Wars universe. CEO Feargus Urquhart has revealed that Obsidian is lobbying heavily to develop a new Star Wars RPG. Rather than step on BioWare's toes and set their game during the Old Republic era, Obsidian is looking to explore one of the darker, more interesting periods of the Star Wars chronology; the fall of the Republic and the extermination of the Jedi. "There's a lot of different eras in Star Wars, and that's what we would focus on," Urquhart told RPS. "We pitched a between-Episode III and Episode IV game [to LucasArts]. Because we think that timeframe is super interesting. It's the fall of the Republic, the extermination of the Jedi, it's Obi-Wan going off and making sure Luke is OK. You have the Sith, but you have the extermination of all Force users except for very, very few. So it was an interesting time to set a game, and you know, Chris Avellone came up with a really cool story." For those of you who don't know your BioWare/Black Isle history, Chris Avellone wrote Planescape: Torment and contributed to a whole bunch of golden age RPGs. His name tends to crop up whenever the words "ever," "writer," "game" and "best" appear in the same sentence. There is, however, one small problem. Lucas arts seemed keen on the pitch Obsidian submitted, but as of October of last year, it'll be Disney that makes the final decision. How are talks going with the house of mouse? Well, they're not. "We haven't [talked with Disney yet]. We're kind of waiting for the smoke to clear," said Urquhart. "But that's one of my next big things to do. To kind of go over there and [get the ball rolling again]."